So often fruit salads seem like an after-thought. Whatever fruit is on hand gets tossed together and served up. They’re not too exciting. Maybe that’s why I have never been a big fan of them. However, this recipe has me re-considering their potential. Sweet strawberries and crisp tart apples are a good foundation with their contrasting flavors and textures. However, it’s the ground cardamom that will really make you sit up and take notice. It adds just a hint of exotic spiciness. Top it all off with some lightly sweetened lemon crème fraîche and now you’ve got something to talk about. I admit when I saw this recipe in this month’s issue of Bon Appétit magazine, I skipped right over it. I read “fruit salad” in the title and immediately turned the page. However, my mother-in-law called me last week and told me how fabulous this recipe was. She had brought it to a dinner party and people couldn’t get enough of it. So, I found the article and started reading (and laughing). I could totally relate to the author’s complaints of boring fruit salads. It was enough to make me want to give this recipe a try. The original recipe combined strawberries and cucumbers but I knew cucumbers wouldn’t go over very well with anyone in my household. Fortunately, I still had some Granny Smith apples in the fridge from last week’s recipe and decided they would be the perfect substitution. I added lemon zest and extra lemon juice to the lemon cream because I felt it needed a little more punch. I also added some extra sugar because my younger daughter was helping me taste test and she has a sweet tooth. That’s why the measurement for the sugar is stated as a range in the recipe. You should definitely do it to taste. Toss strawberries, apples, sugar, cardamom, and a pinch of salt in a medium bowl. Let stand 10 minutes while making the lemon cream. Mix crème fraîche, sugar, lemon juice, and lemon zest in a small bowl. 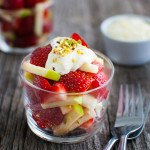 Divide fruit salad among plates and spoon reserved lemon cream over; sprinkle with chopped pistachios. Lemon cream can be made 8 hours ahead. Cover and chill until ready to use. Let stand at room temperature until it softens before serving. Recipe adapted from Bon Appétit, August 2015.